Diplomacy: translations in glass, curated by Ivana Jirasek, was an exhibition of Australian studio glass that responded to the international glass traditions and cultural influence represented by diplomatic missions in Canberra. Participating artists (and their focus country) were Helen Aitken-Kuhnen (Japan), Andrew Baldwin (Malta), Erin Conron (Belgium), Ben Edols and Kathy Elliott (Italy), Hannah Gason (France), Elizabeth Kelly (Finland), Klaus Moje (USA), Lienors Torre (Czech Republic). The exhibition ran from 11 February - 16 April 2015 at the Canberra Glassworks. "Diplomacy: Translations in Glass" presents the work of eight internationally renowned Australian artists who have been paired with a reciprocating High Commission or Embassy." "[T]he French Embassy was very engaged with the work made by Hannah Gason, which was also exhibited at the Embassy in parallel to the Glasswork's exhibition. Hannah's work in pâte de verre is inspired by François-Émile Décorchement who utilised this glass technique in his stained glass windows. Her architectonic forms in the exhibition reference these." "Ivana Jirasek, the guest curator of this exhibition, has brought together the work of eight of Australia's best glass artists in a concept involving diplomatic missions in Canberra." "Hannah Gason is a young glass artist working in pate de verre who is quickly establishing a reputation for innovation in glass. The glassmakers of France, her partner country, are known for the use pate de verre – a glass paste that can be moulded into shapes and forms. 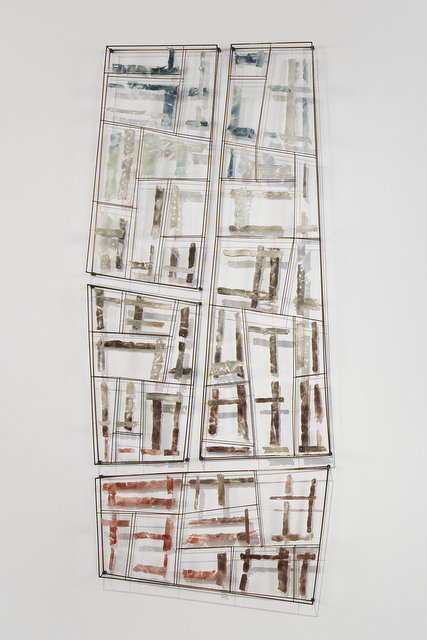 Gason initially studied as a cartographer and it is tempting to see this influence in the grid-like structure of her two wall pieces Window 1 & 2 although they may also be a reference to the lead armatures of stained glass windows. These metal structures have small pate de verre glass shapes influenced by the colours of the Australian landscape almost blown against them like paper against a wire screen. This is a clever and sophisticated design that is both architectural and geometric but overlaid with a decorative motif. At once contemporary in feel, the work sits confidently within the decorative arts tradition." Recent ANU School of Art graduate Hannah Gason had been working for some time with the technique of pate-de-verre, which translates directly as "glass paste", and looks like coloured sugar that would melt in one's mouth. "It had its revival in France during the Art Nouveau and the Art Deco [periods], with Lalique and a whole suite of other artists who are exploring the pate-de-verre style," says Jirasek. "It's a very nice connection for France to have, but she's not only using the pate-de-verre style, she's done the research to see how the technique was initially applied in windows." Gason has been inspired by the artist early 20th-century artist Francois Decorchemont, who used pate-de-verre in stained glass windows. "Decorchemont fused chunks of glass together to create large windows with colourful facets, which generated a vibrant interaction with light," Gason says in her artist statement. She has created her own stylised window, made of floating fragments attached to a metal frame, combined with "architectonic forms" inspired by the Australian landscape.